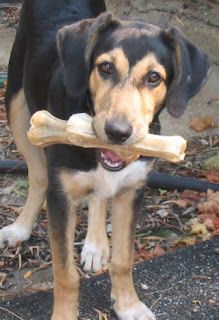 This is a picture of Zaira with two bones. Greedy or what??? ZAIRA: So before drawing this meeting of the ‘Xerika’ Escape Committee to a close, I want to make absolutely certain that everyone is clear what they have to do. Any questions? GELERT: Raising a paw in the air.) Er…. ZAIRA: Oh, for goodness’ sake, Big Guy. What is it this time? GELERT: Well, I was just kind of wondering, er…. If er…. ZIGGY: Oh do get on with it, old boy. Some of us want to get some sleep. GELERT: Er, sorry. I just thought it might be good if you could kind of, er, run the plan by us one more time. ZAIRA: Gelert, we’ve already been through it umpteen times. GELERT: I just want to make sure. That’s all. FOXY: Perhaps it might be simpler if you just tell us which part of the plan you’re not sure of, dear. GELERT: Well, I get the bit about when the humes let us out of our area in the morning and then we all go rushing about the farm like demented things…..
GELERT: And I get the bit about rushing round like demented things once we’re on the other side of the fence…..
GELERT: Well, er, it’s the bit in between I’m a bit hazy on. FOXY: I shouldn’t worry too much, dear. You’ll be working with me all the time so I can tell you what to do. ZAIRA: But he should worry. If he messes up his part, it could blow the whole operation. ZIGGY: Quite agree, old thing. One bad apple and all that caper, eh? ZAIRA: OK, OK, but this is the very last time, so concentrate. ZAIRA: The humes let us out of here in the morning and we rush round like crazy. GELERT: Like we always do. Yup. ZAIRA: Usually they don’t take much notice what we do at this point and it’s vital we use this time while they’re not watching us. GELERT: Not watching us. OK.
ZAIRA: That’s when you, Foxy and I leg it down to the weak part of the fence at the bottom of the land - here on the map. ZAIRA: Meanwhile, Ziggy, Seven, Buster and Poppy will create a diversion -. BUSTER: Yeah, Poppy and I are going to do cartwheels through burning hoops while Ziggy plays the saxophone and Seven does a tap-dance on his head. GELERT: Really? Wow, I’d love to see that. ZAIRA: (Reproachfully) Thank you, Buster. I think we can well do without your remarks. - Now where was I? Oh yes. This is where you come in, Gelert. When we get to the fence, you push against the bottom of it as hard as you can to give Foxy and I more room to dig underneath. GELERT: As hard as I can. POPPY: (Muttering) By George, I think he’s got it. ZAIRA: Then, once the hole is big enough, I’ll signal to the others with three loud barks. ZIGGY: We will have made sure that the humes are back near the house by now. Buster will have stolen one of their shoes and will be giving them the runaround. Once we get the signal, Buster will drop the shoe and he and Poppy will race down to the rest of you. GELERT: Where will you be? ZIGGY: I’m staying behind as a rearguard - just in case. GELERT: That’s very brave of you, Ziggy. ZIGGY: Think nothing of it, old man. A dog has to do what a dog has to do. SEVEN: And I’ll be staying behind to keep him company. ZAIRA: So, Gelert. Are we clear now? GELERT: Yup. And once we’re through the fence, we all rush round and when we get bored we go back home again. ZAIRA: Precisely. And now everyone’s clear what they have to do, I suggest we all get some sleep. Big day tomorrow. GELERT: Oh great. So what’s happening tomorrow then? It’s just fun, fun, fun all the way round here, isn’t it. ZAIRA: (Sighing deeply) Goodnight, everyone. Goodnight. Glad to hear you like my blog. As to your question, we like rolling in stinky stuff as it's good fun to smell like something else now and again. Makes a nice change from just smelling doggy all the time. Fox pooh is best as that really does stink more than any other kind. Also, it drives the humes particularly mad as it takes them ages to get rid of the pong. He-he-he. LOL, awww, that's cute, Buster. You're a real player, aren't you? But my dog already has a boyfriend. She's a pit bull and her boyfriend is a long-hair chihuahua. (Thank goodness they can't have children!) Thanks for the thought, though. "She's a pit bull and her boyfriend is a long-hair chihuahua. (Thank goodness they can't have children!)" Hey, that made me laugh till I pooped. An' you think I couldn't make cat food out of a chew-wah-wah in two seconds flat? I'll need to see a pic and blood analysis before I commit myself. I love your blog. And i must say buster you are a very hansom pup! I have tagged you do to a meme you can get it of of my blog digitalfrenzy.net enjoy! Glad to hear you like my blog and the compliment about my looks. I'm guessing you're a hume, so please pass on my photo to any female dogs of your acquaintance :). As I'm a dog, I'm not familiar with this meme thingy or what I have to do. Please explain if you get the chance. I saw your blog.It is a very nice topic.it is good to see your blog.It's a good chance to know about the dogs better.Always the dogs are vary nice pets.it is better choice for the pet animal. Sorry it's taken me so long to reply but I've been a bit busy. We all think it's great what you're doing and especially the bit about the guide dogs. Sorry we can't help with sponsorship though. I'm afraid we don't have any money, and our humes spend all theirs looking after us lot. Sorry it's taken me so long to reply, but thank you for your kind comments. I tried to look at your blog, but it seems to be in a language I don't understand. Thank you for your kind words about my blog, and you're quite right when you say that dogs are very nice pets!